The Spanish Mastiff originated in Spain and is the national dog breed of Spain. PLEASE NOTE: This breed has been accepted for recording in the AKC Foundation Stock Service (FSS). This is simply an avenue to maintain reputable records regarding the breed’s development. This breed is not eligible for AKC (American Kennel Club) registration. The Spanish Mastiff is considered a giant breed. They can weigh between 145-220 lbs. though some Spanish Mastiff males have reached 265. The Spanish Mastiff stands between 28-35 inches in height. The Spanish Mastiff has a weather-resistant double coat. It is smooth, dense and thick and is medium in length. The Spanish Mastiff is an affectionate, kind and noble dog who is very determined when facing dangerous animals or in front of strangers, especially when he has the opportunity to defend and protect farms or cattle. This breed is a very intelligent. The Spanish Mastiff is an affectionate, kind and noble dog who is very determined when facing dangerous animals or in front of strangers, especially when he has the opportunity to defend and protect farms or cattle. This breed is a very intelligent. Spanish Mastiff is very tolerant towards children and can get along with other household pets provided it has been properly socialized. Early socialization is recommended. This breed will protect its family when necessary, even at the cost of its life. The Spanish Mastiff is gentle and patient, devoted and courageous. You can find Mastin Espanol puppies priced from $0 USD to $0 USD with one of our credible breeders. Browse through our breeder's listings and find your perfect puppy at the perfect price. 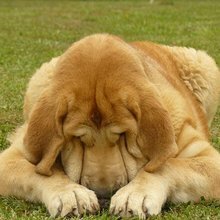 Spanish Mastiff is very tolerant towards children and can get along with other household pets provided it has been properly socialized. Early socialization is recommended. This breed will protect its family when necessary, even at the cost of its life. The Spanish Mastiff is gentle and patient, devoted and courageous. The Spanish Mastiff does not require extensive care. They require occasional brushing and has a lifespan of 8-12 years. When training a Spanish Mastiff, one needs to be consistent and patient and show strong leadership. The adult Spanish Mastiff has a fairly low activity level and will be happy with a daily walk. This is not an active breed and will not be a good fit for a sporty owner who wants to take their dog jogging or out for much physical exertion. The Spanish Mastiff prefers to conserve their energy for when they are needed to defend their family and/or property. Mastin Espanol Puppies for Sale - Shipped Worldwide! Finding the right Mastin Espanol puppy can be dog gone hard work. PuppyFind® provides a convenient and efficient means of selecting and purchasing the perfect Mastin Espanol puppy (or Mastin Espanol puppies) from the comfort of your home, 24 hours a day, 7 days a week. Take advantage of our PuppySearch or leisurely browse our directory of hundreds of dog breeds, Mastin Espanol dog breeders, Mastin Espanol dogs for adoption, and Mastin Espanol puppy for sale listings with photos and detailed descriptions. Some Mastin Espanol puppies for sale may be shipped Worldwide and include crate and veterinarian checkup. Many Mastin Espanol dog breeders with puppies for sale also offer a health guarantee. With thousands of Mastin Espanol puppies for sale and hundreds of Mastin Espanol dog breeders, you're sure to find the perfect Mastin Espanol puppy.